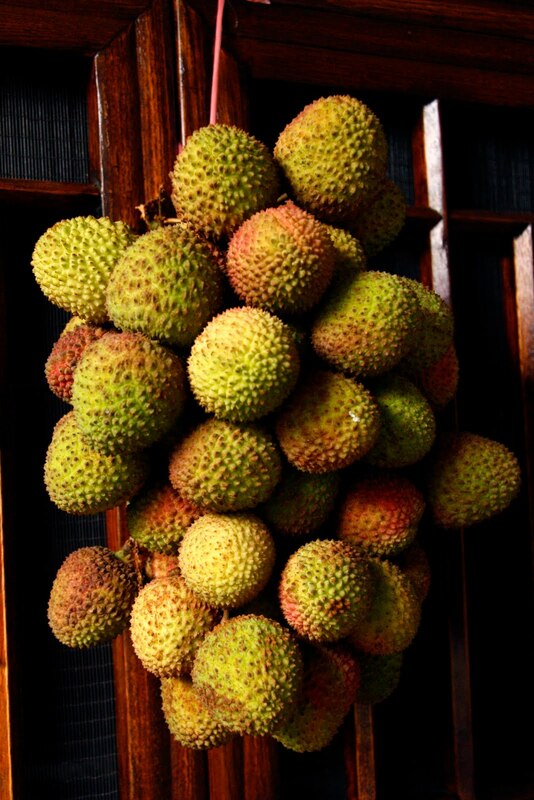 Life on Nanchang Lu: Lovely Lychees! Take a look at these beauties! The weather is slowly warming up, and with it all sorts of fantastic tropical fruits are making a comeback in the fruit stores. Like the mangosteens I wrote about a few weeks ago, these lychees taste amazing. Now that I live in a place where it's pretty difficult and extraordinarily expensive to get anything out of season (and rightly so) I have come to really appreciate the seasonality of the fruits and vegetables I'm eating. And they taste so much better too! So in my local fruit store, after the relative fruit austerity of the Shanghai winter (pomelo, apples, oranges, kumquats, winter strawberries) there is now an abundance of choice - pineapples, rambutans, durian, lychees, summer strawberries, watermelon, honeydew melon, papaya, mangosteen, bananas, mulberries. And these are just the ones I know the names of. The lychees are at their peak right now. Each one is the size of a fat apricot, and they're sold like this, still on the stalk, tied in a bunch. The bunch above weighs about 2.5 kg. The tough, knobbled skin yields that delicious juicy, fresh, perfumed lychee flesh. Heaven!